Till the eighteenth century, Bengal's Muslin was exported all over the world. But due to the terrible torture of the British rulers, the production of Muslin was stopped. The painful history is well-known. Similarly, production of Baluchari sari of Bengal was totally stopped. But, due to the endeavor of a great connoisseur of this art, it has been revived. 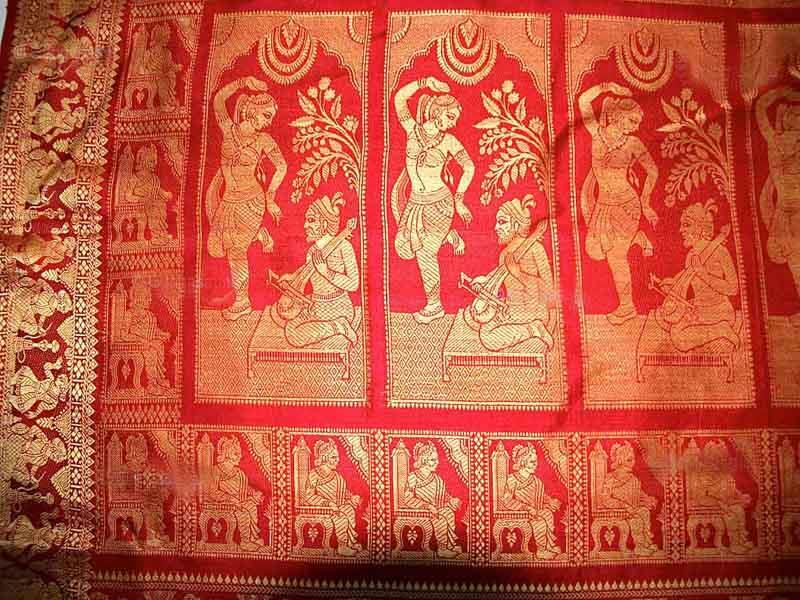 Let us know about Baluchari sari, the pride of Bengal. What is the specialty of the Baluchari saree? Before the advent of camera and photography, people used to paint to present a visual image. Not only painting, there were various art forms to present visual images. Baluchari saree used to be a medium for the creation of such visual image-for telling a story. Each and every Baluchari sari used to tell a different story through the images depicted on each sari. Baluchari saree originated at Baluchar-a very prosperous village in the district of Murshidabad. The art form was actively encouraged by the Nawabs including famous Murshid Quli Khan and other aristocrats of the Bengali society. The weavers were very prosperous and Baluchari sari was (and still is) exported to foreign countries and all over India. After a devastating flood in Bhagirathi river (a tributary of the Ganga), the weaving community of Baluchar was shifted to a safer place. Bishnupur in present Bankura district was the capital of Malla dynasty and a much safer place. The weaving community was shifted to Bishnupur and the progress of Baluchari continued unabated. In the days of Nawabs, the entire process including cleaning, sorting of cotton, spinning, dyeing, pattern, warping and finally weaving was man-made. The entire family of the weavers used to be engaged in this work. Even then, in a year only two to three saris could be produced. Each saree was created with a separate motif based on a theme. The lifestyle of aristocrats, the story of the epics and other fairy tales were used as a theme. Each sari used to tell a different story and the entire design was created in a hand-made loom. Many people (including the British rulers) used to get confused by these designs and used to think these designs were paintings on canvasses. As already said, an entire family of weavers could produce only two-three Baluchari saris in a year. The weavers faced tremendous pressure from the British rulers and businessmen. With the economic downfall of the country, the weavers started losing their patrons. Many weavers switched their profession. As a result, the craft saw a steady decline. Last known and famous weaver of Baluchari, Dubraj Das, breathed his last in 1903. He was known for Baluchari sari with his signature. The saris with his signature are still found in some collections. With the death of Dubraj Das, the making of Baluchari was stopped. British rulers left the country in 1947. In 1956, Subho Thakur, a great artist born in the world-famous Thakur family, made an earnest endeavor to revive the great weaving tradition of Bengal. At that time, he was the Director of the Regional Design Centre of West Bengal. He took out the Baluchari saris off his family, showed it to Akshay Das, a master weaver, and after making many experiments like Jacquard weaving, various new motifs like Ajanta-Ellora paintings, Ramayana and Mahabharata, temple architectures, etc., use of different cotton and silk from South India. After tireless effort, Subho Takur, Akshay Das and other renowned weavers of Bishnupur finally revived the pride of Bengal, Baluchari sari. Again the sari got the attention of Indians and the eminent people of the world. The intricate weaving attracted the ladies. Baluchari sari has again become famous all over the world. There are different variants of Baluchari sari named Chitro, Kolka, Parh and Buti. The motifs can be seen in anchal, parh and the main part of the sari. The price depends upon the intricacy of design. An authentic Baluchari sari nowadays costs in the range of Rs. 10,000/- to Rs. 50,000/-. Sometime a Baluchari sari with intricate and elaborate designs with uncommon motif can go upto Rs. 80,000/-. Such sari with intricate design is not readily available. It must be ordered beforehand and can take six months for delivery. Ladies of ISC! During the next major festival, why don't you demand a Baluchari sari from your husbands? I don't know what is more beautiful? Is it the author's unique narration or the image of the Baluchari sari? Well, both of them are beautiful and unique. Baluchari sari is also sometimes called as Baluchar sari. It is not only popular in India but also worn by women in Bangladesh. On sari’s pallu, unique designs are present. Each sari is a unique collection. Each one depicts scenes from mythology. West Bengal is the only proud state where this unique sari is produced. Replicas and copy materials can be found in other states too. However, if one wants to purchase an authentic Baluchari sari, one has to go to West Bengal. Right from the dying stage to the weaving and packaging, care is taken to maintain high quality. It is a work of high precision. It is the status symbol. It is a symbol of aristocracy. It is not an easy process. The whole production is divided into various segments. Since it is a silk sari, silk cocoons and worms need to be cultivated. To achieve softness, yarn needs to be boiled in a soda and soap solution. Once the boiling process is completed, acid color is used to dye it. Once the yarn becomes soft, care is taken to make it crisper. To achieve this, it is stretched in the opposite directions from either end. Now comes the real hard work of motif making. It is a work of delicate intricacy. Motifs are made not only on pallu but also on the other parts of the sari. Intricate designs are drawn above the graph paper. They are colored. Cards are used for punching and are later orderly sewed. In the jacquard machine, cards get fixed. Jacquard loom is introduced. It requires almost a week for a weaver to do the job. Sometimes weavers work in different shifts to complete the process.